First, let me give you some background information on the 7A-FE in case you don't already know. The 7A-FE is the last in Toyota's great line of A-series engines. 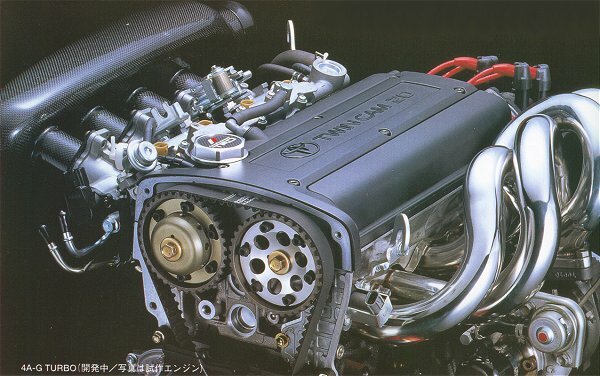 It is an inline-4, DOHC, 1762cc 16v MAP-based engine. 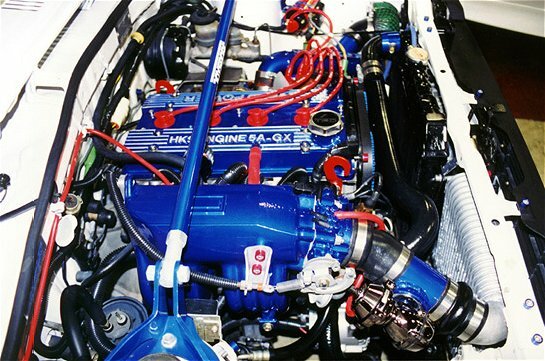 The other (very) popular A-series engine is the 4A-GE, available in beauties such as the Corolla GTS, MR2, and Levin, with 16 or 20 valves, naturally aspirated or supercharged! The 4A-GE also powers all the race cars in the KOOL/Toyota Atlantic Championship, North America's premier open-wheel development series. The 7A-FE shares basically the same block as the 4A-GE, but with 200cc's more displacement (~1800cc vs. ~1600cc), the difference being in the stroke. The 7A-FE's bottom end isn't quite as strong as the 4A-GE's though. The 7A-FE connecting rod is longer and skinnier, and the crank is not forged. Another major difference between the 7A-FE and 4A-GE is the cylinder head. Toyota designates the "F" as meaning "economy head," while the "G" means "performance head." 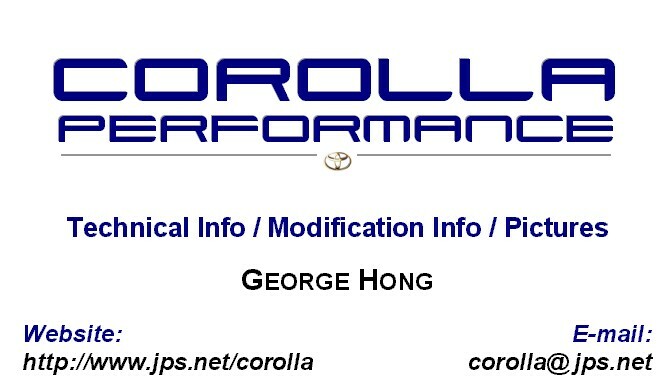 (The following information originated from Gary M. of the Toyota Mods Mailing List) The G head uses two widely spaced cams directly pushing the valves and driven by their own sprockets. This allows for very high valve speeds and excellent valve control for better performance. The larger angle between the valves also makes a chamber with more surface area, and with a domed piston, even more surface area. This allows for more compression while dissipating the heat better, so it won't detonate as easily. Also, the ports can be straighter so that they will flow better at high velocity thus making more top end power. Why does Toyota make an F head? The F head has close spaced cams with only one drive sprocket and a pair of gears to drive the other cam. The narrow angle between the valves makes for a more compact chamber that will hold the heat in and allow for a faster burn, and the port shapes improve low rpm velocity. This all makes for a more efficient engine with more torque at low speed and cleaner emissions while burning the lower amount of fuel. Basically, that is the reason for the two designs. The latest 7A-FE actually makes as much power as the MK1 4A-GE and more torque both at lower revs, but this is all due to the 200cc's more displacement. The better G head would definitely make even more but would consume more fuel and possibly lose some low end torque. Lastly, the "E" stands for "electronic fuel injection." 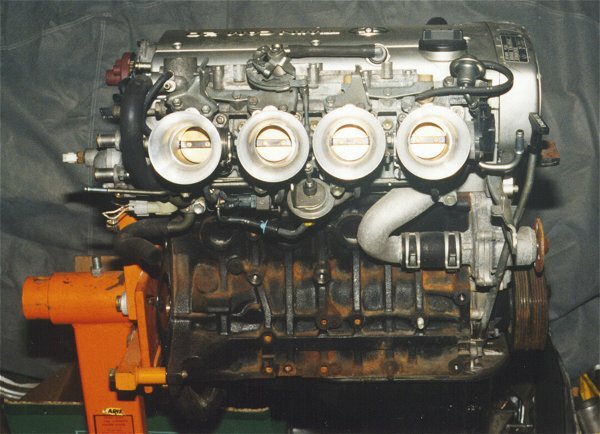 The 7A-FE is available in the AE102 as well as in the ST version of late model (AT200) Celicas. 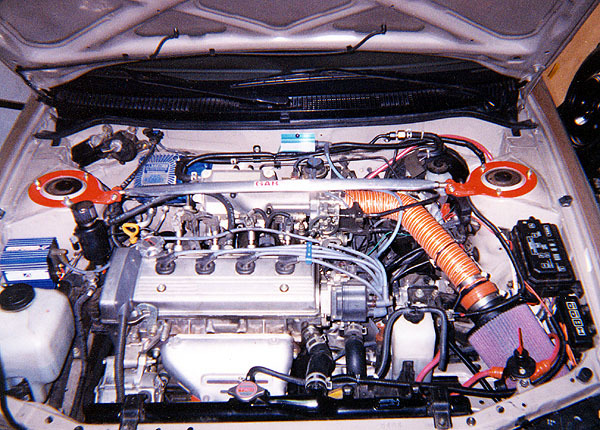 The engine bay of these Celicas looks almost identical to the AE102's. Click here to see a 7A-FE in a Celica. Because of this engine "sharing," just about everything mentioned here will be applicable to the Celica 7A-FE (as well as any other 7A-FE). So you want more power from your AE102? Consider converting your stock 4/7A-FE engine to a custom 7A-G(Z,T)E! This single, yet extremely significant, mod will give you more gain than almost any other mods you could throw your money at, so if you're serious, you know what you gotz to do. 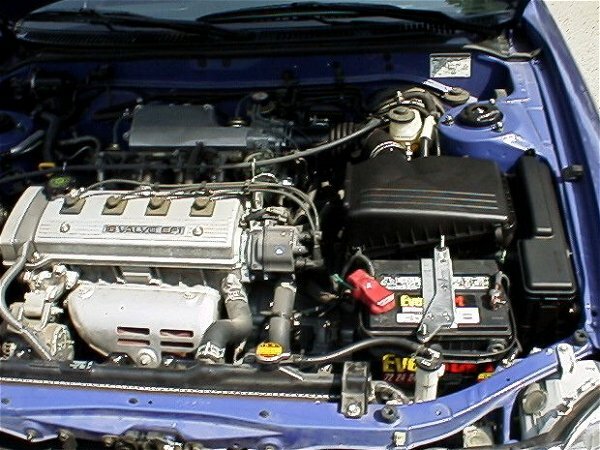 The conversion entails swapping in the G cylinder head from a 4A-G(Z)E engine along with a supercharger (optional, designated as "Z"). Turbocharging is an option also. Sticking with the 7A block gives you the 200cc advantage. 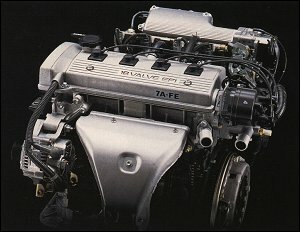 If you have the 4A-FE engine (1600cc also), the most feasible route would be to pull it out and swap in a 4A-GE (20 valver! ), 4A-GZE, or 7A-G(Z,T)E. (A 3S-GTE might fit with a big enough shoehorn, but I won't even go into that.) The reason I recommend a complete swap is because it would be cheaper and result in a better engine than swapping heads on a 4A-FE. Sorry, but the 4A-FE has no intrinsic advantage. Talk about watered down. Furthermore, the 4A-FE block is not identical, although very similar, to the 4A-GE block. 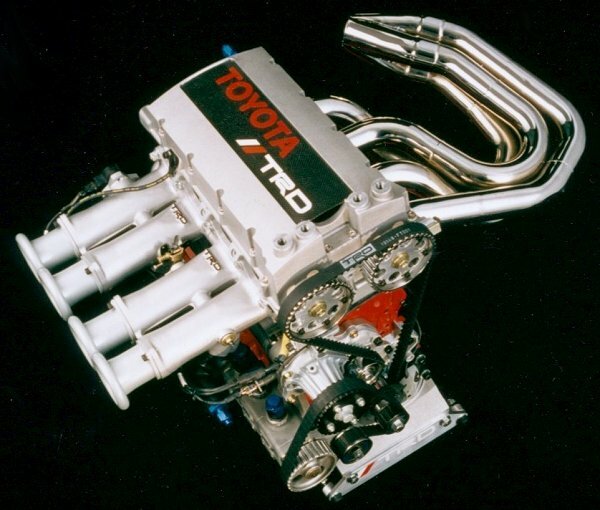 Why would you want to build an engine Toyota already built better? I'm in the process of converting my engine to a 7A-GZE. When that is done, I hope to document my experiences for anyone who wishes to do the same, or just for information's sake. Here's a great idea! 4A stroker kit, overbore cylinders with custom pistons, 20 valve head, twincharger kit...damn!!! How many trannies can that thing blow up! Click here to go the 7A-G(Z,T)E Conversion Information Page. This is where I will be documenting my conversion as well others (and all relevant info). Check out this beautiful 20v 4A-GE! 20v 4A-GT all prepped up! This pic is from the Corolla Dress Up Catalog (pg. 117). Ok, so it's a 3S-FE...in a Corolla. The electronic ignition system in the AE102 is perfectly capable of igniting fuel mixtures. This is actually true for almost all modern engines. For this reason, it is not highly recommended that you spend money on an aftermarket performance ignition system unless you plan to run boost or increase compression in some way because it would be one of the least bang-for-your-buck mods. However, if you have the money to spare, a performance ignition will only do you good. I currently have a Jacobs Electronics Pro Street Ultra Team setup, and my seat-of-the-pants dyno tells me it gives me a little bit more power...not much, but I can feel it. Of course, I need to do some dyno runs to confirm this. More objectively, the setup gives me about 15 more miles per fillup. Click here to see the latest Ultra Team info from Jacobs (in PDF format, 723kB). I had a Mileage Master Ultra Team prior to this, but it got toasted (i.e, sparks, smoke, heat) after over a year for a reason I can't figure out. Other manufacturers are MSD, Crane, etc. I've heard "toast" stories about Crane units but don't really know anything about the MSD units. People run them, so they must be worth something. If all you're looking for are spark plug wires, go with Jacobs Electronics or Magnecor (8.5mm). I don't think TRD makes wires for the AE102. As for Nology's capacitive discharge technology, some like it while others don't (I don't). Spark plugs? C'mon, that's not a mod...that's a tune-up part. Get regular coppers. You can't go wrong with NGK or NipponDenso. I've made available both manufacturers' spark plug info charts in the Technical Information section, as well as a tech article on spark plugs. Remember to use the correct heat range for your application. In most cases, factory specifications are fine (e.g., NGK BKR5EYA is the standard plug for the 4/7A-FE). A K&N replacement drop-in air filter is good enough in most cases. The stock airbox should flow enough air as is, even though the inlet is rather smallish. 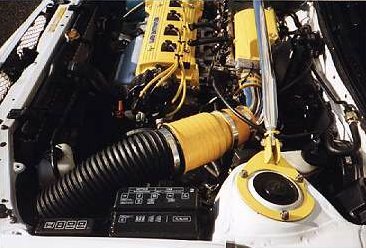 If you go with an open cone-type setup, you risk losing power by sucking in hot underhood air. An intake "heat shield" is available to address this, or you can make your own. If you want to modify the intake setup, I recommend you route the intake to a cool air source (or at least not hotter than stock). Don't look to aftermarket parts here; this will entail some custom plumbing, but the job should be pretty straightforward. I suggest removing the intake resonator by the fender well and routing from the throttle body to the fender or air dam. 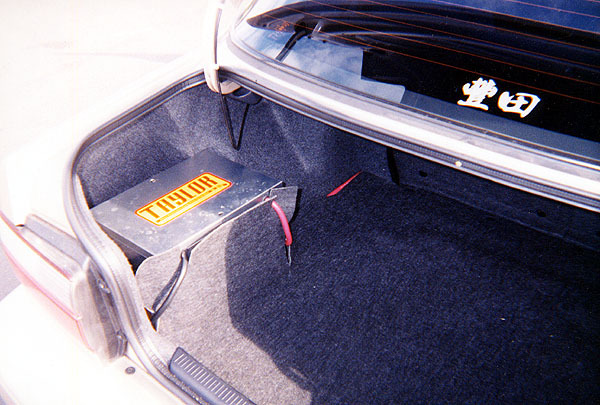 Relocating the battery to the trunk (a very good idea) will free up more room under the hood for this, as well as improve weight distribution. You can make sure the new setup is better by measuring the intake air temperature and pressure during test runs. The two PCV hoses coming off the valve cover allow crankcase fumes and blowby gases to pollute the intake air. To keep the intake air clean, plug these two holes on the intake side and route the PCV hoses to a catchcan with a breather. Just remember to clean out the catchcan as necessary. The outlet end of the PCV valve is 3/8", and the non-valved outlet is 1/4". The following pictures illustrate a few examples. Just stick with a full synthetic, and you'll be fine. Run conventional oil during break-in periods only. Oils I recommend are Red Line, Mobil 1, Motul, and Amsoil. Red Line is great but too expensive to justify for regular use. Amsoil and Motul are good too but aren't readily available. Therefore, just go with Mobil 1. You can find it at just about any auto parts store.